I’ve already explained why we bought our dutch oven, but here it is again in case you missed it. It somehow helps to know. Our good friend next door, Jami, bought her husband a dutch oven for Father’s Day. We’d been thinking about getting one for months, so after we had some of their apple crisp, I went out the next day and bought one. 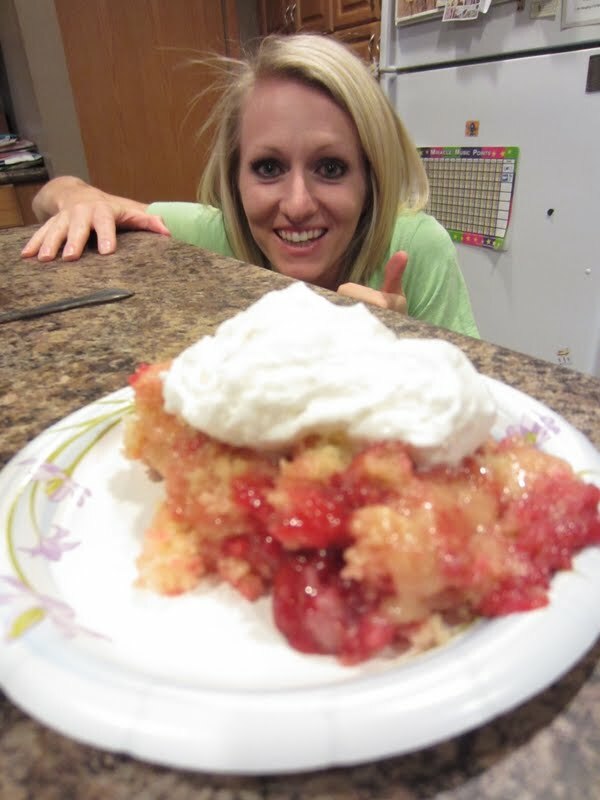 So we decided to do a Dutch Oven night…Jami made delicious enchiladas and I made strawberry shortcake. It doesn’t look all that impressive, but it sure was good! 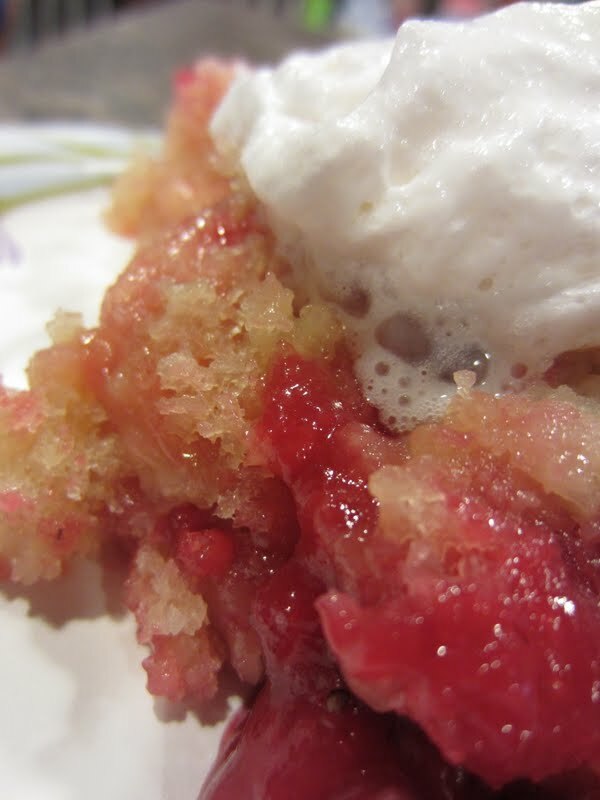 I still need to get Jami’s recipe and try it out, it was yummy! I’m still figuring out the amount of coals I need when using the volcano stove. It took forever to bake, and was still a little underdone. Done enough to eat it though! Our good friend Emily (and family) came for our Dutch Oven Night. Luckily, she’s always camera-ready. Recipe lightly adapted from Dutch Oven Madness. Several hours ahead of time, slice strawberries and gently toss with sugar. It will be beautiful and syrupy when you’re ready to make your shortcake. Sprinkle the marshmallows into the bottom of a greased 12″ dutch oven. Sprinkle the jello powder over the strawberries and gently combine. Set aside. Cream shortening and sugar. Add eggs, one at a time, beating well after each addition. Add vanilla. Combine flour, baking powder, and salt; add to creamed mixture alternately with milk. Pour the batter over the marshmallows. Spoon the strawberry mixture evenly over the batter. Bake at 350° for 45-50 minutes, or until a toothpick comes out clean. Top with whipped cream or ice cream. Or light cool whip, which is what we had. *I used my Volcano Stove to cook with my dutch oven. I used 6 coals on the bottom and 12 on top. It wasn’t enough heat to get it all the way cooked, but it was close. Next time I think I’ll try 7 on bottom and 14 on top. *You can also use a 16 oz package of frozen, sweetened, sliced strawberries. I’m sure they’re fine and all, but I was a few strawberries short of a full pound of fresh, so I pulled out a few frozen ones and tossed them in. They had a different appearance after the shortcake baked, they weren’t as pretty. But mainly I used fresh berries because the frozen, sweetened ones were really expensive. Chicken Parmesan…And Figuring out the Dutch Oven! !